If you are trying to increase your protein intake without adding too many calories to your diet, an egg-based breakfast is one solution. Eggs are versatile: You can make poached eggs, scrambled eggs and omelets with any combination of vegetables. However, if you are bored of eating eggs, try other high-protein, low-calorie breakfast possibilities without eggs. Prepare a tuna salad with the equivalent of 6 ounces of tuna, preferably packed in water to keep the calories low, mixed with 1 tablespoon of light mayo and diced celery. Add salt, pepper and other seasonings to taste. Spread the tuna salad over one or two large lettuce leaves and sprinkle with 1 ounce of grated cheddar cheese. Wrap it up and enjoy this breakfast, which contains 310 calories and 34 grams of protein. Salmon is a good source of healthy omega-3 fatty acids and provides plenty of protein. Instead of serving your salmon on a bagel, which is high in calories, use cucumber. Cut half a cucumber in slices. Spread each slice with a total of 2 tablespoons of low-fat cream cheese and top with a total of 6 ounces of salmon. This breakfast contains 405 calories and 38 grams of protein. 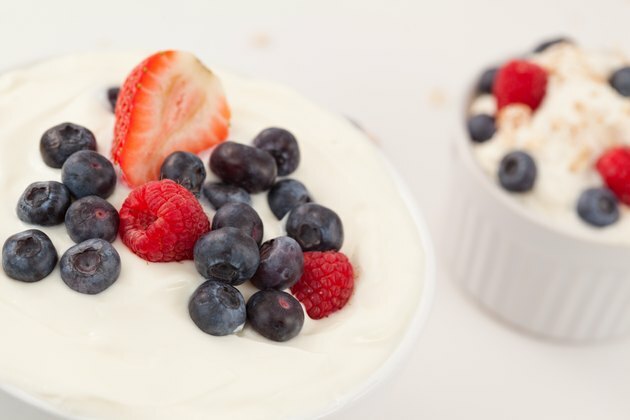 Mix 1 cup of 1-percent cottage cheese with 1 cup of strawberries and 2 tablespoons of peanut butter. This breakfast is quick and easy to put together and you can take it with you. This combination is high in protein and low in calories, with a total of 356 calories and 36 grams of protein. Use the equivalent of 4 ounces of a deli meat, such as turkey. On each slice, spread a little light mayo, using between 1 and 2 tablespoons in total. Cut 2 ounces of part-skim mozzarella and a quarter of a red bell pepper into sticks and place in the center of your turkey slices. Roll your turkey slices and enjoy this breakfast which will give you 323 to 371 calories, depending on the amount of mayo used, and 29 grams of protein. A smoothie is good option if you need something quick to prepare in the morning or breakfast you can take with you. In a blender, put 1 cup of low-fat milk with a scoop of sugar-free whey protein powder, or the equivalent of 24 to 30 grams of protein, 1 banana, 1/2 cup of blueberries and 1 tablespoon of ground flaxseeds. Blend until smooth and your high-protein, low-carb breakfast is ready. This smoothie has 411 to 435 calories, depending on the type of whey protein used, and 35 to 41 grams of protein.